If you have a weak, cracked, or damaged tooth, it is important to obtain the proper treatment to protect the tooth and help you avoid tooth loss. When a tooth is severely damaged, dental crowns can be used to save the tooth so that it doesn’t have to be pulled. Here at Millennium Dental, we offer high quality crowns for teeth, as well as other dental restoration services. To learn more about this dental crown procedure, we invite you to contact our office right away to schedule a consultation. Has a dentist suggested that you have a dental crown procedure? This process is an effective way to strengthen your tooth, and you should talk with your dentist about the reasons that you need to have the crown. The dental crown procedure is beneficial because it offers long-lasting results to keep your teeth looking good. Once the crown is in place, it functions like a natural tooth and you don’t need to worry about the weakness of the tooth. 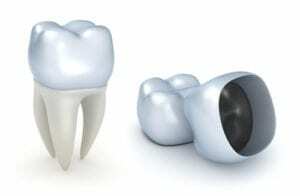 This crown is very durable, and it will hold up with regular wear and tear from eating and daily lifestyle. At Millennium Dental, we offer a variety of dental services to ensure that you have the right treatment for your individual situation. Our experienced team will talk with you about your dental needs, the options that are available, as well as the cost of the procedure. Many times, it is beneficial to have a dental crown placed within your mouth, but it isn’t always the right treatment for every situation. We will put together a dental plan that is specific for you. If you are searching for a way to improve the appearance and quality of your smile, we invite you to contact us to learn more about the benefits of dental crowns. You will see that these services can be a great way to restore your smile and strengthen your teeth.